Has the Government doubled the budget deficit? in the May 13 budget. and now he's asking the Australian people to pay for it", Mr Bowen told journalists in his electorate on April 27. ABC Fact Check examines whether this statement is correct. 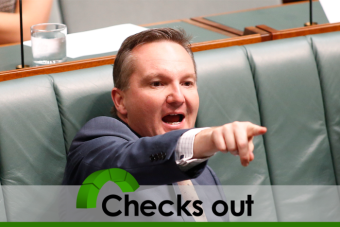 The claim: Chris Bowen says Joe Hockey has doubled the deficit by changes to Government spending and changes to Government assumptions. forecasts. Mr Bowen's claim checks out. medium-term projections adopted by the former Labor government. adopted by the Coalition, following advice from Treasury. secretaries. All other documents are documents of the Government." known as the forward estimates period, which is four years. to a surplus of $4.2 billion in 2016-17. These forecasts total a deficit of $54.6 billion over the four-year forward estimates. years were deficits of $33.9 billion, $24.1 billion and $17.7 billion. These total $123 billion over the four years of the forward estimates. corresponding number in the PEFO. Mr Bowen is correct on this figure. Have there been changes to Government spending? in the budget position since the 2013 PEFO." the Government has brought forward new spending that Labor "buried"
beyond the four years of the forward estimates. Labor disagrees. have been paid to the Reserve Bank while Labor was in government. Labor... when they took out dividends from the Reserve Bank..."
response to a specific request from the bank. been required under Labor policies. It is clear that changes to Government spending have contributed to the doubling of the deficit. Have the economic assumptions changed? caused by "parameter and other variations" changes. forecasts of wage growth and corporate profitability. more than $37 billion over the forward estimates," the MYEFO said. sector was expected to be more gradual. Are they 'Government' assumptions and projections? forecasts as the Treasurer of Australia," he said. change underlies the doubling of the deficit. is what we accept," he said. of increasing deficits to $123 billion..."
sense of shame that they left a slower economy". the MYEFO are ultimately decided by the Government. Mr Bowen accurately quoted changes totalling $68 billion in the Mid-Year Economic and Fiscal Outlook. MYEFO forecasts a budget deficit twice as large as it was in the PEFO. It remains to be seen how the two sets of forecasts stand the test of time, but as of today, Mr Bowen's claim checks out.